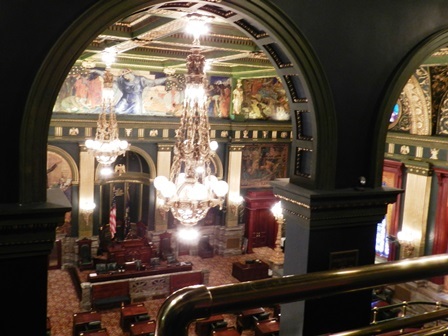 Linda Burton posting from Harrisburg, Pennsylvania – “This is the handsomest building I ever saw,” is a quote they brag about in Harrisburg. That’s what President Theodore Roosevelt said on October 4, 1906, when he attended the dedication of the Pennsylvania state capitol. Now, I’ve seen a lot of capitol buildings (this is the 47th one on the Journey) and I try to be very careful not to compare one to another, focusing instead on the unique and beautiful qualities of each. But I found myself looking around for my socks today, because (figuratively speaking) my first glimpse inside this capitol’s rotunda knocked them off. Architect Joseph Huston (1866-1940) envisioned the capitol as a “palace of art” and he did not miss the mark. It is described as a “priceless architectural and artistic treasure” and its 600 rooms burst with so much color, and so many messages, that “sensory overload” must be a way of life for those who work inside. 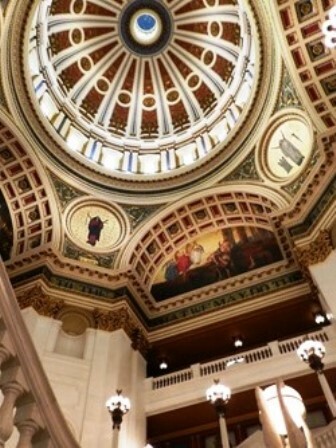 And everybody does – the executive, judicial, and legislative branches are housed in the capitol; it is the workshop of Pennsylvania state government. It’s a huge complex of Renaissance marble and gold; the outside (five stories high) is Vermont granite, the roof is green glazed terra cotta tile; inside you’ll see Italian, French, English, Greek, Roman and Victorian influences. 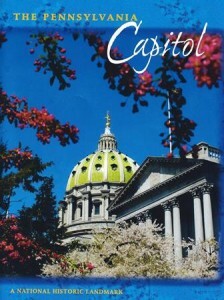 Yet somehow, Huston pulled it all together while telling the story of Pennsylvania, making it an all-American edifice. 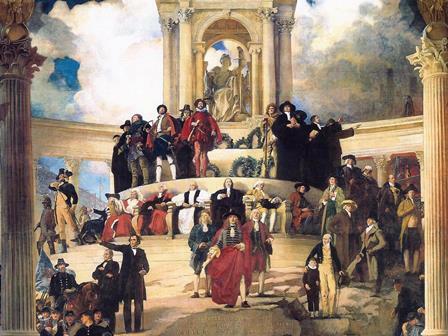 Because first and foremost, the capitol is a public building, belonging to the citizens of the Commonwealth. The marble staircase was set to showcase a wedding today; the guest chairs waited in place. 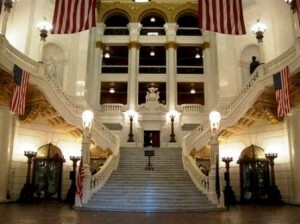 I asked about the rotunda, but my guide pointed to the floor; “Let’s start with the Moravian tiles,” she said. 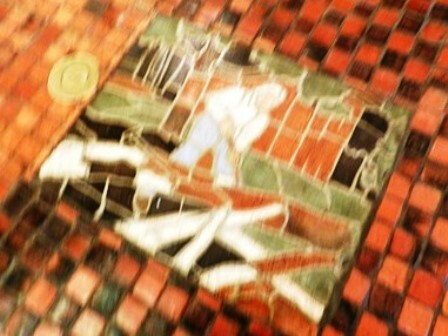 The colorful tiles that cover the floor of the rotunda and the first floor corridors are Pennsylvania German folk art, designed and manufactured by Henry Chapman Mercer (1856-1930) of Doylestown. Almost 400 tile mosaics illustrate the state’s history, animals, industries, occupations, and modes of transportation. I snapped a few shots of animals, and what I thought was a settler chopping wood, on the way to the elevator. Senate Chamber. My socks were knocked off again. 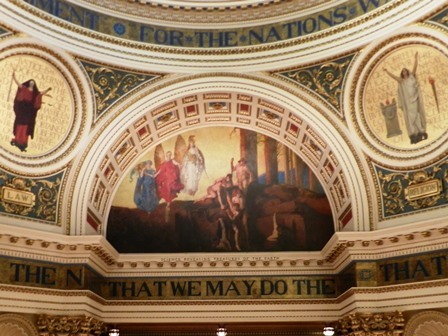 My brain could not absorb it all, nor could my camera; the walls of almost-black dark green were adorned with gold; a 44-foot-wide mural spread side to side high over the Senate president’s desk; larger-than-life murals fit under arches on either side of it. “The murals were done by Violet Oakley,” my guide explained; “one of the first women ever to have been given such a monumental task.” The massive Madonna-like figure with arms outstretched in the center spot wears a blue gown that becomes the “waters of life;” see the waves curving at the edges? Oakley (1874-1961) named the mural “International Unity and Understanding;” an active Christian Scientist, Oakley did not believe in war; the mural features swords beaten into ploughshares and Dante handing symbolic fruits of culture to the masses. Other panels show Gettysburg troops and the Gettysburg Address; and the Constitutional Convention delegates; but it was hard to focus on any one thing; my eyes kept switching from one grandeur to another. The massive iron and glass floor standards weigh about two tons each, I was told. 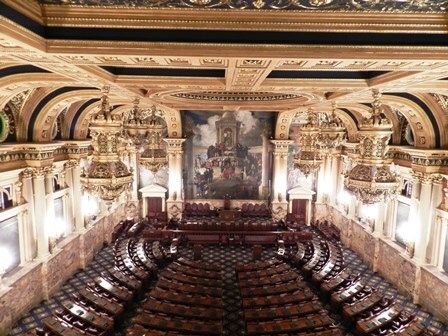 The green marble that lines the walls is from Ireland; the mahogany of the senator’s desks (original) is from Belize. “How many senators?” was my last question. 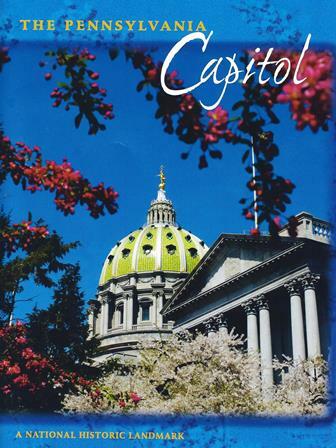 Pennsylvania has 50 state senators, was the answer; each serves a four-year term and represents approximately 246,000 constituents. And they still vote with verbal ayes and nays. Supreme Court. Pennsylvania’s Supreme Court meets in three places, explained my guide – Philadelphia, Pittsburgh, and Harrisburg. 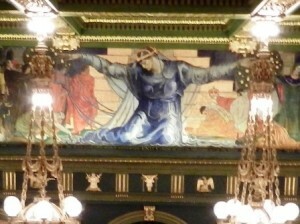 She led me into the Harrisburg chamber, which contains sixteen paintings done by Violet Oakley. “Stand in front of this one and look at the letters,” I was told, so I positioned myself to clearly see the “Love” painting. 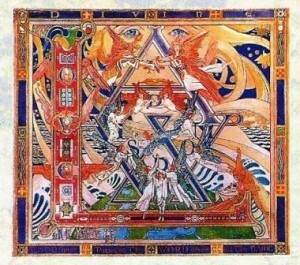 It took a while before I saw the “L” that framed the left and bottom of the painting; then I saw “O V E” painted inside the left portion of the “L.” Can you see the woman’s eyes, top center? The letter “A” begins right there; below that is the “W,” spelling LAW. Look very carefully inside the “W” to see the rest of the word “Wisdom” spelled out. 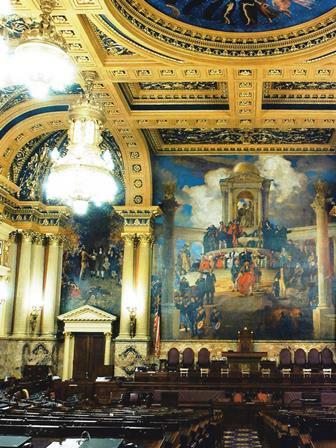 My guide then turned my attention to the painting of “The Ten Commandments,” prominently displayed behind the chair of the Chief Justice, between the American flag and the Pennsylvania state flag. “Interesting,” I said. House Chamber. I cannot describe the House Chamber to you, you simply must go see it for yourself. 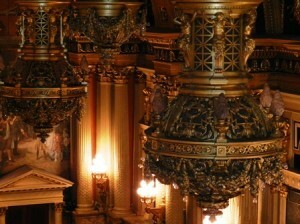 My camera was powerless too, inside the huge, cavernous, ornate space. 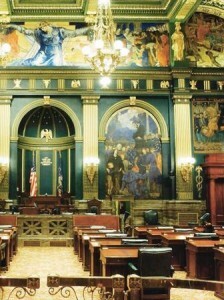 It can accommodate over a thousand individuals on ceremonial days; it seats 203 representatives during session. About the art – five murals by Edwin Austin Abbey (1852-1911) decorate the walls, including “The Apotheosis,” located behind the Speaker’s podium. It is 35 feet square, and depicts explorers, intellectuals, and leaders from the state’s past. According to the numbered key, that’s William Penn center front, flanked by Benjamin Franklin and Robert Morris (Morris established the first Bank of North America and was a financier of the American Revolution). Can you spot Thomas Paine, or Daniel Boone? The mythical figure at the very top represents “Genius of State.” The fourteen stained glass windows, created by William Van Ingen (1858-1955), are four feet in diameter and framed in 24-karat gold leaf embellishments, featuring themes such as Abundance, Justice, and Education. The Speaker’s throne chair is carved from pollard oak; the mace is made of solid mahogany topped by a brass sphere engraved with the Coat of Arms of the Commonwealth. 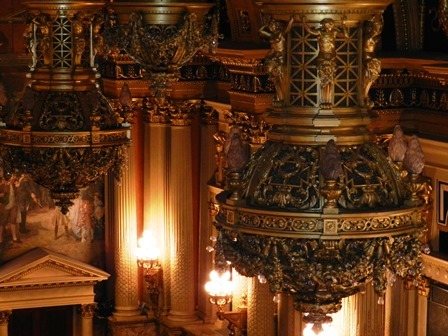 The chandeliers weigh from two to four tons each, and require over 1,000 light bulbs. What else can I say? My socks are lost again. Oh yes, for a modern touch, they vote electronically and function paperless; laptops sat neatly atop every desk. My guide apologized that she could not take me into the Governor’s Reception Room today, but explained that it contains a grandfather clock that is over a hundred years old, and more paintings by Violet Oakley; those paintings depict the history of religious liberty in England, and the rise of the Quaker religion. Back in the rotunda again, I finally got to ask my question. “What are the words I can barely see running around the top?” “Those are the words of William Penn, expressing his hopes for the new land,” she explained, and recited them without pause. There may be room there for such a holy experiment, for the nations want a precedent. And my God will make it the seed of a nation. That an example may be set up to the nations. That we may do the thing that is truly wise and just. I thanked my guide profusely for a good tour; we parted company. I wanted to sit and study the murals for a while, but the neatly-rowed chairs reminded me that a wedding would be happening soon; I’d best be on my way. And besides, my feet were cold.